Two more great options to add to your Cook'N Cookbook collection! 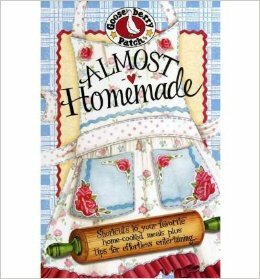 Almost Homemade by Gooseberry Patch offers over 200 recipes while using handy shortcuts. Using premade baking mix, shredded cheese, canned soups, fruits, and vegetables, and refrigerated biscuits, it will cut down your prep time and get food on the table fast! Breakfasts, Nibbles, Soup and Salads in a Snap, Scrumptious Sides and Breads, Shortcut Suppers, and Effortless Ending separate recipes into easy to find chapters. Rise and Shine Quiche, Golden Fortune Eggrolls, Mexican 3-Bean Soup, Cowboy Stew, Cheesy Chicken Pot Pie, Chuckwagon Casserole, Peanut Butter ice cream pie, and Oklahoma Coconut Cake are just a few of the recipes that I can't wait to test out! This Quail Ridge Best of the Best from the Midwest Cookbook is another winner! Tons of country cooking has been crammed into this book. Might as well get your Midwest recipes like Cincinnati Chili, Sugar Cream Pie, and Chicago-Style Pizza straight from the source! 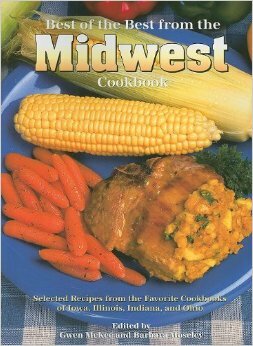 This book features recipes from Ohio, Indiana, Iowa, and Illinois. Try out a vegetable frittata, Hunker Down Popcorn, Overnight Cinnamon rolls, Shaker tomato soup, Amish Style Baked Beans, Shepherd's Pie, Elephant Ears are all must-try recipes. I have a special spot in my heart for Amish cooking and several of the recipes in this cookbook have been gathered from a previous Amish Cookbook from Quail Ridge. This recipe book is full of heart and yummy recipes.